"When you come to somewhere like Libya, you expect lies and deceit from the dictatorship here. 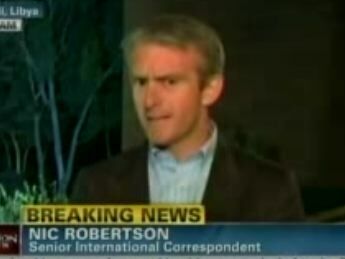 You don't expect it from the other journalists," CNN international correspondent Nic Robertson said of a FOX News reporter who claimed the Libyan government is using media outlets, including CNN, as human shields against attacks. FOX News reports: An attack on the compound of Libyan leader Muammar al-Qaddafi on Sunday had to be curtailed because of journalists nearby, Fox News has learned. British sources confirmed that seven Storm Shadow missiles were ready to be fired from a British aircraft, but the strikes had to be curtailed due to crews from CNN, Reuters and other organizations nearby. Officials from Libya's Ministry of Information brought those journalists to the area to show them damage from the initial attack and to effectively use them as human shields.